The St. Teresa’s Charity Pantomime Horse Race at the UK’s Catterick Racecourse raises funds for St. Teresa’s Hospice in Darlington. In its third annual running, the race welcomed four entrants: Heavy Brigade in the cow suit, racing for the Royal Dragoon Guards; Unicorn on the Cob in the unicorn suit, racing for marketing agency Purple Creative; #Professionals in the horse suit, a last-minute entry from Racing UK; and Wonky Donkey, racing for Lookers Volkswagen. At the start, Heavy Brigade got away well, but Wonky Donkey quickly made up the ground to press the leader. Unicorn on the Cob appeared to lose part of itself out of the gate and #Professionals was the early trailer. Wonky Donkey inexplicably drifted in to the rail and crashed spectacularly, followed shortly by a stumble and fall from #Professionals, leaving the race wide-open for a repeat win by Heavy Brigade. 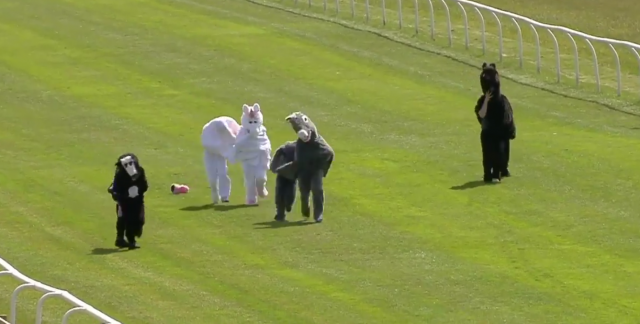 Absolute carnage in the St. Teresa's Charity Pantomime Horse Race!! While not a particularly impressive feat of athleticism, this year’s Pantomime Horse Race was certainly memorable from start to finish.